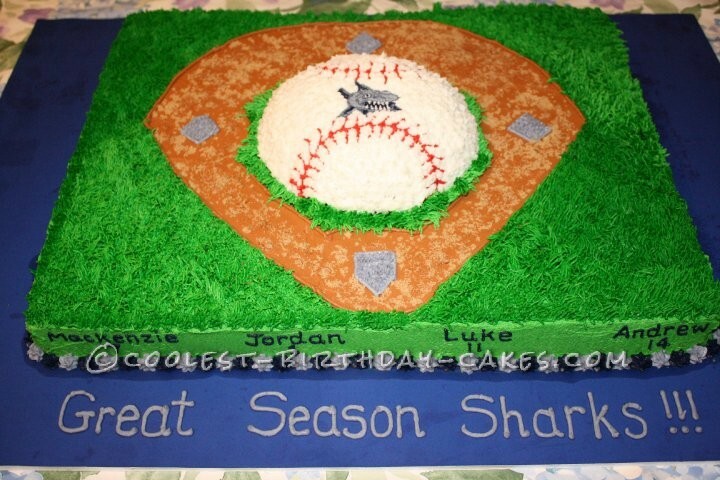 I made this Baseball diamond cake for my son’s end-of-the-season baseball banquet. The large rectangle cake on bottom is a fudge marble cake, and on top of it is a small round cake which I used a dome-shaped oven safe bowl to make. I used butter cream icing on the entire cake, which I made myself using the Wilton recipe. 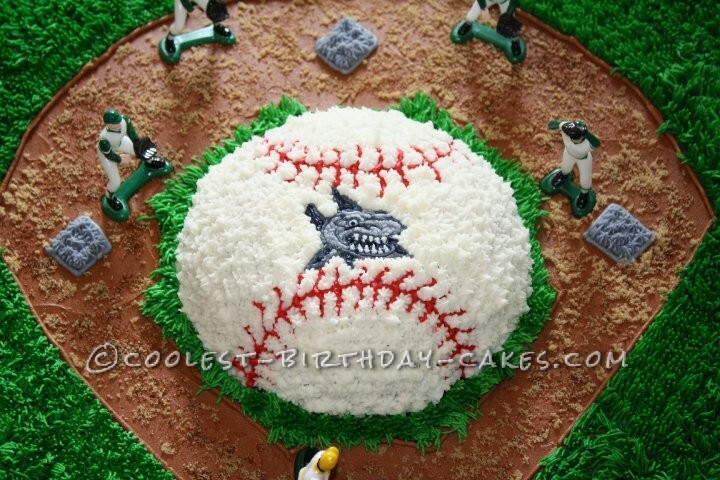 The first step in decorating this cake was to draw out the baseball diamond shape in the middle. I frosted a large area in the center with light brown icing, and then outlined the shape I wanted the diamond to be. Grass will be outside the diamond so when first applying the diamond’s icing, it doesn’t have to be perfectly inside the line. I then placed the round cake in the center of the diamond and decorated it using the star tip. I used the butter cream transfer method to draw the shark. I got a picture of the shark I wanted, taped it to a board, and covered it with wax paper. 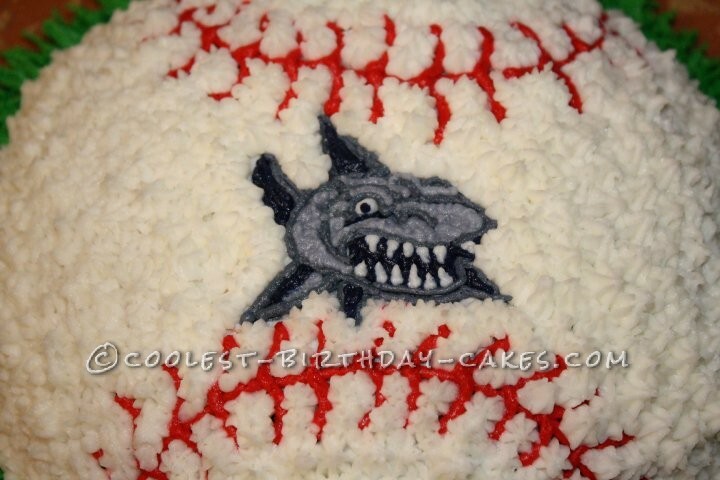 I literally traced the shark using icing and filled it in with the colors I wanted. I froze it for 20 minutes and then flipped it onto the ball where I wanted it. Then I decorated the rest of the ball. This is tricky as if you don’t transfer it really quickly, the icing will thaw and ruin the entire thing (I have had this happen more than once!!)! 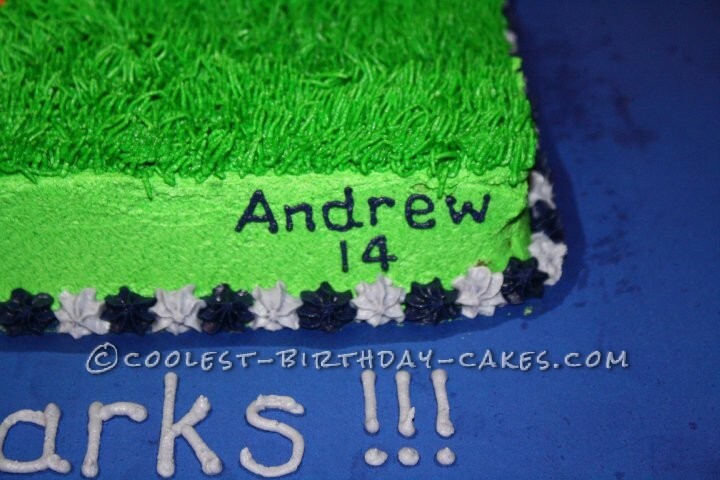 I then drew and decorated the plates on the field, and did smooth green all around the sides of the bottom cake. I did the grass using the grass/fur tip which took quite a while considering the large size of the cake. 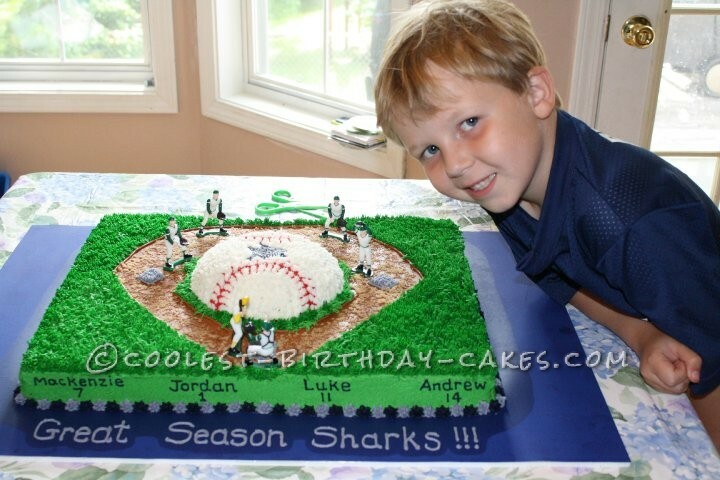 The players are from a baseball kit you can buy at craft stores, and to add the finishing touches, I wrote each player’s name and team number around the outside of the bottom layer, to sort of personalize the cake for each player. The players and parents were all really excited to see the cake and it got a lot of compliments!! It really was not a difficult cake at all, just time consuming! !